Chishimba Kambwili has taken his fight with the Patriotic Front (PF) to Parliament, calling them a bunch of thieves who have stuffed themselves with stolen wealth. Contributing to debate on President Edgar Lungu’s speech on Tuesday, the Roan member of parliament described the salary increment given to civil servants as a “big joke”. And Kambwili, whose debate was repeatedly interrupted by Speaker of the National Assembly Patrick Matibini, warned mining companies that he would soon go for them soon after the PF is removed from power in 2021. 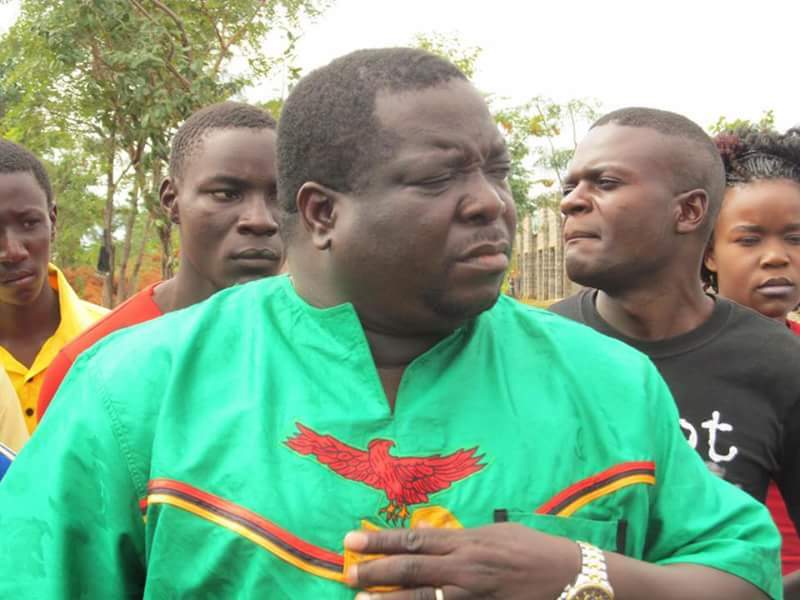 Kambwili: How can he come here and boast that my government is working? You need to leave it to the people of Zambia to leave it to the people of Zambia to decide whether you are working or not. How does a President come to Parliament and say his government is working when for four years, the civil servants have never had a salary increment and after four years, you give them 10 per cent and say ‘we are working’, I think we should be serious with ourselves and not to mock the poor. We should stop mocking the poor people. An average civil servant earns about K3,000 a month, give them 10 per cent, it is about K300 and yet within the same four years, you have removed subsidies on fuel, you have increased, in one year, the cost of electricity by 75 per cent and you are giving the civil servants this 10 per cent effective in January before the Minister of Finance gives the budget, we don’t know what new measures in terms of taxes will be contained in the Minister of Finance’s budget. Speaker Matibini: Honorable member for Roan, take a seat. Order! Let’s have some order please. Honorable member for Roan, you are obviously a very senior member of the House and you cannot proceed in that fashion and for those honorable members who are in the habit of running commentaries are a source of disruption themselves. You see, in a democracy you need to be tolerant, you may not like what the other person is saying but still listen to that person and when the opportunity comes, counteract what they have said, that is the way you proceed in a democracy so honorable member do not be distracted, continue with your debate also. Kambwili: Mr Speaker, at least for me, I belong to a government where we get 300 per cent salary increment in one calendar year. That is thinking of the poor. When PF came to power, we gave the civil servants 300 per cent salary increment. Now this new PF, 10 per cent. Speaker: honorable member, there is only one PF. And you belong to that PF (laughs). You belong to that PF as far as my record is concerned. You are Roan member of parliament under PF ticket. Speaker: honorable member, when you refer to combination, you are debate colleagues. We can read between the lines, continue. Kambwili: Thank you Mr Speaker, one of the issues that I heard where the President even said, and I heard him very well where he said ‘Mr Speaker, your government is working, is on the social cash transfer’, this is another way of mocking the poor. The social cash transfer is K70 per month and here is a President who cares for the people who says ‘Mr Speaker there is a woman in Western Province in Kalomo who from social cash transfer is able to pay school fees, she has built a house, she is even able to pay for people to work in her field’, K70? Nangu kutumpika abantu, I think lets be serious with leadership. If we have nothing to talk about, you better keep quiet. I mean, there are over 10 newspapers on the streets today and I am sure the President reads about seven of these newspapers at K10. So the cost of these newspapers per day is what you give to the poor and you come and say we are working (laughs), we will leave it to the people of Zambia to decide. Economic diversification, ‘Mr Speaker, we are now going to give all the districts, we are now going to use e-vouchers, we are diversifying’, let’s be serious. This is the only country where when you grow a lot of maize, then the agricultural sector is doing well, there is no agriculture to talk about in Zambia and if we were serious about the agriculture sector, this country could have been a middle income country by now but because our priorities are wrong, because for us we only look at the bumper harvest of maize without even finding out where the bumper harvest is coming from and where it came from. If you remember very well Mr Speaker, before President [Levy] Mwanawasa came into power, the growing of maize was at a very small scale because the people did not have a market where to sell their produce. President Mwanawasa allowed the FRA to start buying maize beyond the 500,000 so that FRA can provide a market for the maize and because there was a ready market for the maize, people got interested knowing for sure that there would be FRA coming to buy our maize but today, this government has gone back to say that we are only going to buy for strategic food reserve meaning therefore that they have killed the market for maize for the poor peasants will stop growing maize and I can assure you, there will be no bumper harvest next year because we have gone back to the old days where people used to go with salaula to go and exchange with maize. And people stopped growing maize because they were not getting any reasonable income from maize. KCM, they just changed the name from outsourcing to secondment which is one and the same and the minister goes, ‘you can go ahead now’. People are being transferred without being paid their terminal benefits, the new people who have come will be responsible for everything including their terminal benefits, you call it secondment? Me what I know about secondment is that the company where you are coming from continues paying your salaries, terminal benefits and if you are found with a case, you have to go and answer to your employers but the miners have been told everything has been transferred to the new Chinese and we know that Chinese are able to do. K700 per month for a miner going underground and we have a government. Miners, we are coming to sort you out. Kambwili (responding to running comments): you see, there is no government in perpetuity. The goodness about political power is that there is a period, five years, others come in so miners, don’t worry, it’s only four years, we are coming. Health, what is there to talk about? What is there to talk about in terms of health facilities in Zambia that people can even come to this House and boast that we are working, go and look at the hospitals, you cannot believe it. UTH here just as you enter UTH, there is a pothole and everyone passes there directors, oh, ministers they say don’t mention them, and you can’t believe these things. You go to Roan, thanks to Steve Chungu and Chishimba Kambwili, our hospitals are very clean, porcelain tiles in all the wards. Look at the ceilings, rhino ceilings, that’s leadership, it’s not just to come here ‘we have hospitals’, very dirty hospitals, no linen, no blankets, no medicine ati you have hospitals, please, stop mocking the poor, you go to good hospitals and then your friends are going to hospitals where when they arrive, they even become more sick and you come here and boast. Even where you come from, I went to Kasama with a committee on health, Mwandaba, you know that red polish, that’s what they paint in Kasama General Hospital, the honorable can say that. Surely, 53 years after independence you can allow such a thing? And then you say your government is working, working where? Education, the schools can’t even talk about [them], community schools that are manned by unqualified teachers are performing far much better than government schools. I feel sorry for my elder brother [General Education Minister Dennis] Wanchiga, he is very hard working but he found the system is already collapsed. If you look at the results in government schools, the attitude of teachers, how many periods the children are taught, you would cry, and we have a government. You say you are working at the same time you say the poverty levels are very high, continue with your statistics, inflation six per cent, GDP growth 4.5, as long as it does not trickle down to the ordinary people to enjoy it, you are gone the way MMD went. MMD recorded excellent economic growth, seven per cent, eight, nine per cent, inflation was six per cent but it was not trickled down to the poor people, the civil servants enjoying their sweat, that’s where MMD lost elections. I love PF, can we change the way we do things so that we can maybe stay in power for another five years but change the President. Namugala: Honorable member, honorable Kambwili you will not use this House to campaign. Let’s debate the President’s statement, there are enough issues in this speech honorable member for Roan to occupy you for the entire 20 minutes, there is enough. Let’s debate the speech. Kambwili: I mean, if you are dipping, plundering the national coffers with impunity the way we are seeing in this government, you can come here and say no it’s 800km, you talk about hotels, who told you to build hotels? Is that the job of the RDA? Kambwili: The people of Zambia will have the last say, the corruption we are seeing in this government is more than the corruption that Chiluba did in 10 years. Nawina, nabanonka, nibakabolala aba! This is becoming interesting. I think CK will really make PF work. Kabwalala stopped from stealing reveals former accomplices. Send a thief to catch a thief!If you live in a glass house………………..
Kambwili is a another Malema. He is needed in Zambian politics. He is not a coward. The problem with Zambian politicians are there as source of employment. Thus many are cowards. Agreed. Push the thieves to the corner. After all they have failed to prove corrupt allegation they fired you from government. This is mere hate and hipocricy of the waste kind. Kambili’s construction companies got government jobs unmeritoriously when he was a minister in PF government . Now that he is not able to get those jobs dubiously , he is extremely bitter. His companies benefitted from the Eurobond which the the many poor zambian people will have to pay while this hipocrit lives in comfort. So please don’t play saint when you are an even bigger culprit. Mike, Can you substantiate your statement? Criminals are never respected, however rich they can be! do your level best to exculpate yourself!!! Umulandu taubola it will follow you to the grave, tormenting and torturing you! Mike, anti corruption to date has failed to convict ck. Please we need this guy to speak for us cowards. If he got contracts I’m sure they were genuine and that he was clever enough to become a mining supplier than bring a Chinese. We all know why kambwili was fired.not corruption but a threat to presidency.all those perceived to be presidential candidates are having a tough time in Zambia,why because you want to behave like chiluba with his third term.